My concerns are profound – insofar as I believe that CITES has become the biggest impediment to implementing “best practice” management to ALL Africa’s wildlife resources; and that if CITES continues in its present direction, it will not be the “saviour” of Africa’s wildlife but the “cause of its demise”. 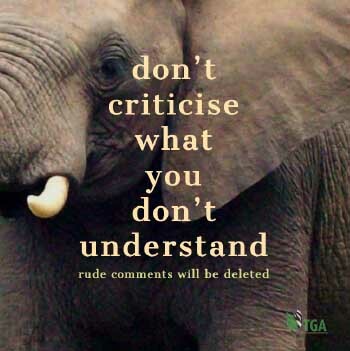 It is my opinion – shared by many others – that CITES has become dysfunctional, that it is now far too “corrupt” to change, and that it represents the biggest of all dangers to Africa’s wildlife. I, therefore, believe that CITES should be dissolved and replaced with a more honest convention which will be more conscious about properly regulating the accreditation of its NGOs – allowing accreditation only to those NGOs who intend to further the best interests of the convention’s purpose and disallowing the accreditation of those whose who want to change its purpose altogether. In this regard, I point my finger directly at the very powerful animal rightist NGOs whose purpose at CITES is NOT to “regulate” the trade in wildlife but to “prohibit” it. And if these animal rightists NGOs succeed in their endeavours – to render Africa’s wildlife valueless – THAT, alone, will cause the total extinction of wildlife in Africa by the end of the current century. Wild animals that have no value to Africa’s rural people will be replaced by them with cattle, sheep and goats – which DO have value to them. On the other side of the coin, if Africa’s rural people can make more money out of the sustainable use of wild animals, than they can from their cattle, sheep and goats, they will replace domestic animal husbandry with sustainable wildlife management practices. And that simple explanation will tell ALL intelligent people which of these two options is the better one for Africa, for Africa’s people, and for Africa’s wildlife. It also explains why the animal rightist NGOs who have been accredited to CITES, represent the biggest danger to Africa’s wildlife; and the worst possible kind of opposition to the upliftment of Africa’s rural people. I am also disgusted by the fact that for the last three decades, AND MORE, certain NGOs have – one way or another – purchased the votes of the sovereign state delegations; and when during SC69 it was proposed that an NGO disciplinary code be introduced to eliminate this corruption, the Secretary General, himself, pooh-poohed the idea on the grounds that it was not necessary. The Secretariat’s primary concern now appears to be to satisfy the needs of its accredited animal rightist NGOs and not its sovereign state members (the ONLY members that REALLY count). Certainly, the Secretary General (John Scanlon) by presenting himself at various sacrificial ivory and rhino horn “burnings” around the world has given credibility to this unbelievable ritual. Scanlon, therefore, has shown that, AT THE LEAST, he is a fellow traveller of the animal rights brigade. I find it incredible that the head of CITES does not view, with the greatest of concern, the now well-known practice of purchasing votes by NGOs whose purpose is to skew the outcome of the consensus in the direction that THEY want it to go! And THAT ALONE does not say very much for the integrity of the convention – which is supposed to be primarily safeguarding the interests of its sovereign state members. Please note: The animal rightists purpose in life is to abolish all animal uses by man. Ask yourself the question, therefore, why would an animal rightist NGO WANT to join CITES – a convention that is designed to REGULATE wildlife trade (of which the animal rightists openly disapprove)? The animal rightists involvement with CITES can only be to sabotage the very purpose of the convention. 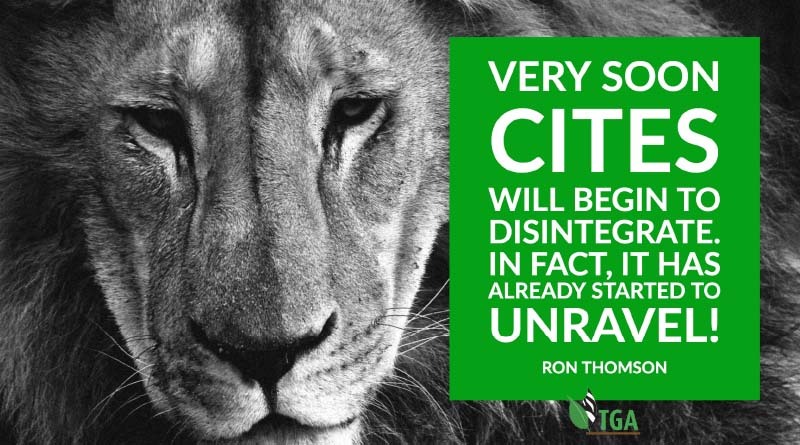 Something, therefore, is VERY wrong with CITES and intelligent and honest people (including many official CITES delegations) are getting restless. And I think the United Nations should be concerned, too, because very soon CITES will begin to disintegrate. In fact, it has already started to unravel! And when the American delegation wafted around its official “Pelly Amendment” legal instrument at CITES CoP17 last year – to get dissenting parties to “toe the American line” (that is, to carry out “America’s wishes” ), the CITES “circus-ring” became complete. I have written MANY magazine articles and books on this subject but nobody in the UN seems to care a damn – just so long as nobody rocks the boat. I have served Africa’s wildlife continuously now for 58 years (I became a game ranger, aged 20, in 1959) and I have quite literally “had enough” of CITES skulduggery. I intend now to rock the CITES boat – as seriously as I am able! My most important concern is for what is happening to Africa’s wildlife. My least concern is to keep CITES – the Nemesis of Africa’s wildlife – functional. The worst thing that CITES is doing at the moment is, slowly but surely, closing down the markets for ivory and rhino horn in China, Laos, Vietnam, Japan and elsewhere. If these Far Eastern countries truly want to help Africa, Africa’s people, and Africa’s wildlife – to survive in symbiotic harmony into posterity – they should keep their wildlife product markets open and work with African countries to create legal, open and transparent markets in ivory, rhino horn and lion bones; and all other wildlife products. Creating controlled and sustainable markets in these commodities is the best way to proceed for everybody. Prohibition – to achieve a desired outcome in whatever commodity – has never worked anywhere at any time in human history. It will not work, NOW, with wildlife. And the people who “appear” to be doing the most to “save” Africa’s elephants and rhinos – those who are closing down all the markets for elephant ivory and rhino horn – are going to be the primary cause of the extinction of these iconic animals. And in the process – through their propaganda apparatus – the animal rightists are making millions (US$) in the process. How gullible can society be? It is high time that society wakes up to the distortion of the facts by CITES and animal rightests before we lose the last our natural heritage in Africa. Thank you Ron for standing up for the preservation of wildlife in Africa especially elephant and rhino and lion. Case well made. There is more land available as habitat for conservation on which game now flourish due to sustainable utilisation similar to Campfire project and Ducks Unlimited efforts. Fantastic article. I am often glad to see my thoughts validated- but this? this is very sad. How it happened with the African grey being uplisted to Appendix I was a crime. Granted we don’t want wildlife trafficking, but this uplisting made matters so much worse and ruined the lives of 1000s of South African families. There is now 10s of 1000s of aviary-bred parrots not being sold, and the parent bird’s fate is in limbo for lack of income to feed them, and caretakers wages gone. Less than 40 of the 1600 breeding farms are now registered for export. Those domestic exports were just about to put the wild-caught trade out of business. I just hope the S. African breeders can recover. Aviculturists all over the world knew this would happen, but we couldn’t stop it. The Animal Rights NGOs have taken over CITES. We know the U.S. NGOs that did this, and we are at war! The NGOs don’t care about illegal trade, they want all animal trade to stop.